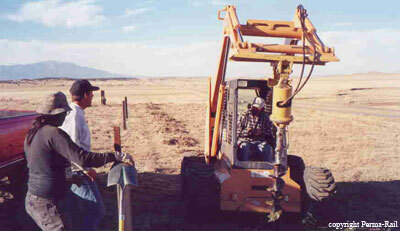 Most Snow Predator fences are based the Perma-Rail Component Sleeve System. Although each fence is custom designed for the ground conditions and fence requirements, there are four basic steps to installing our snow and wind fence. After determining fence placement, holes are drilled on 10 to15 foot centers. Size, depth and spacing is determined by the fence height, purpose and environment. Send mail to perma@ida.net with questions or comments about this website � 2005 Perma-Rail International Inc.